The Federal Reserve Bank (or simply the Fed), is shrouded in a number of myths and mysteries. These include its name, its ownership, its purported independence form external influences, and its presumed commitment to market stability, economic growth and public interest. The first MAJOR MYTH, accepted by most people in and outside of the United States, is that the Fed is owned by the Federal government, as implied by its name: the Federal Reserve Bank. In reality, however, it is a private institution whose shareholders are commercial banks; it is the “bankers’ bank.” Like other corporations, it is guided by and committed to the interests of its shareholders—pro forma supervision of the Congress notwithstanding. The choice of the word “Federal” in the name of the bank thus seems to be a deliberate misnomer—designed to create the impression that it is a public entity. Indeed, misrepresentation of its ownership is not merely by implication or impression created by its name. More importantly, it is also officially and explicitly stated on its Website: “The Federal Reserve System fulfills its public mission as an independent entity within government. It is not owned by anyone and is not a private, profit-making institution” . Some people think that the Federal Reserve Banks are United States Government institutions. They are private monopolies which prey upon the people of these United States for the benefit of themselves and their foreign customers; foreign and domestic speculators and swindlers; and rich and predatory money lenders. The fact that the Fed is committed, first and foremost, to the interests of its shareholders, the commercial banks, explains why its monetary policies are increasingly catered to the benefits of the banking industry and, more generally, the financial oligarchy. Extensive deregulations that led to the 2008 financial crisis, the scandalous bank bailouts in response to the crisis, the continued showering of the “too-big-to-fail” financial institutions with interest-free money, the failure to impose effective restraints on these institutions after the crisis, the brutal neoliberal cuts in social safety net programs in order to pay for the gambling losses of high finance, and other similarly cruel austerity policies—can all be traced to the political and economic power of the financial oligarchy, exerted largely through monetary policies of the Fed. The [private] Central Bank is an institution of the most deadly hostility existing against the principles and form of our constitution . . . . If the American people allow private banks to control the issuance of their currency . . ., the banks and corporations that will grow up around them will deprive the people of all their property until their children will wake up homeless on the continent their fathers conquered (Thomas Jefferson, 3rd U.S. President). In 1836, Andrew Jackson abolished the Bank of the United States, arguing that it exerted undue and unhealthy influence over the course of the national economy. From then until 1913, the United States did not allow the formation of a private central bank. During that period of nearly three quarters of a century, monetary policies were carried out, more or less, according to the U.S. Constitution: Only the “Congress shall have power . . . to coin money, regulate the value thereof” (Article 1, Section 8, U.S. Constitution). Not long before the establishment of the Federal Reserve Bank in 1913, President William Taft (1909-1913) pledged to veto any legislation that included the formation of a private central bank. I am a most unhappy man. I have unwittingly ruined my country. A great industrial nation is controlled by its system of credit. Our system of credit is concentrated. The growth of the nation, therefore, and all our activities are in the hands of a few men. We have come to be one of the worst ruled, one of the most completely controlled and dominated governments in the civilized world. No longer a government by free opinion, no longer a government by conviction and the vote of the majority, but a government by the opinion and duress of a small group of dominant men . While many independent thinkers and policy makers of times past thus viewed the unchecked power of private central banks as a vice not to be permitted to interfere with a nation’s monetary/economic policies, most economists and policy makers of today view the independence of central banks from the people and the elected bodies of government as a virtue! And herein lies ANOTHER MYTH that is created around the Fed: that it is an independent, purely technocratic or disinterested policy-making entity that is solely devoted to national interests, free of all external influences. Indeed, a section or chapter in every college or high school textbook on macroeconomics, money and banking or finance is devoted to the “advantages” of the “independence” of private central banks to determine the “proper” level of money supply, of inflation or of the volume of credit that an economy may need—always equating independence from elected authorities and citizens with independence in general. In reality, however, central bank independence means independence from the people and the elected bodies of government—not from the powerful financial interests. Independence has really come to mean a central bank that has been captured by Wall Street interests, very large banking interests. It might be independent of the politicians, but it doesn’t mean it is a neutral arbiter. During the Great Depression and coming out of it, the Fed took its cues from Congress. Throughout the entire 1940s, the Federal Reserve as a practical matter was not independent. It took its marching orders from the White House and the Treasury—and it was the most successful decade in American economic history . Another MAJOR MYTH associated with the Fed is its purported commitment to national and/or public interest. This presumed mission is allegedly accomplished through monetary policies that would mitigate financial bubbles, adjust credit or money supply to commercial and manufacturing needs, and inject buying power into the economy through large scale investment in infrastructural projects, thereby fostering market stability and economic expansion. Such was indeed the case in the immediate aftermath of the Great Depression and WW II when the Fed had to follow the guidelines of the Congress, the White House and the Treasury Department. As the regulatory framework of the New Deal economic policies restricted the role of commercial banks to financial intermediation between savers and investors, finance capital moved in tandem with industrial capital, as it essentially greased the wheels of industry, or production. Under those circumstances, where financial institutions served largely as conduits that aggregated and funneled national savings to productive investment, financial bubbles were rare, temporary and small. Not so in the age of finance capital. Freed from the regulatory constraints of the immediate post-WW II period (which determined the types, quantities and spheres of its investments), the financial sector has effectively turned into a giant casino. Accordingly, the Fed has turned monetary policy (since the days of Alan Greenspan) into an instrument of further enriching the rich by creating and safeguarding asset-price bubbles. In other words, the Fed’s monetary policy has effectively turned into a means of redistribution from the bottom up. This is no speculation or conspiracy theory: redistributive effects of the Fed policies in favor of the financial oligarchy are backed by undeniable facts and figures. For example, a recent study by the Pew Research Center of income/wealth distribution (published on December 9, 2015) shows that the systematic and escalating socio-economic polarization has led to a sharp decline in the number of middle-income Americans. The study reveals that, for the first time, middle-income households no longer constitute the majority of American house-holds: “Once in the clear majority, adults in middle-income households in 2015 were matched in number by those in lower- and upper-income households combined.” Specifically, while adults in middle-income households constituted 60.1 percent of total adult population in 1971, they now constitute only 49.9 percent. According to the Pew report, the share of the national income accruing to middle-income households declined from 62 percent in 1970 to 43 percent in 2014. Over the same period of time, the share of income going to upper-income households rose from 29 percent to 49 percent. A number of critics have argued that, using its proxies at the heads of the Fed and the Treasury, the financial oligarchy used the financial crisis of 2008 as a shock therapy to transfer trillions of taxpayer dollars to its deep pockets, thereby further aggravating the already lopsided distribution of resources. The Pew study unambiguously confirms this expropriation of national resource by the financial elites. It shows that the pace of the rising inequality has accelerated in the aftermath of the 2008 market implosion, as asset re-inflation since then has gone almost exclusively to oligarchic financial interests. Proxies of the financial oligarchy at the helm of economic policy making no longer seem to be averse to the destabilizing bubbles they help create. They seem to believe (or hope) that the likely disturbances from the bursting of one bubble could be offset by creating another bubble! Thus, after dot-com bubble, came the housing bubble; after that, energy-price and emerging markets bubble, after that, the junk bond market bubble, and so on. By the same token as the Fed re-inflates one bubble after another, it also systematically redistributes wealth and income from the bottom up. This is an extremely ominous trend because, aside from issues of social justice and economic insecurity for the masses of the people, the policy of creating and protecting asset bubbles on a regular basis is also unsustainable in the long run. No matter how long or how much they may expand financial bubbles—like taxes and rents under feudalism—are ultimately limited by the amount of real values produced in an economy. Is there a solution to the ravages wrought to the economies/societies of the core capitalist countries by the accumulation needs of parasitic finance capital—largely fostered or facilitated by the privately-owned central banks of these countries? Yes, there is indeed a solution. The solution is ultimately political. It requires different politics and/or policies: politics of serving the interests of the overwhelming majority of the people, instead of a cabal of financial oligarchs. The fact that profit-driven commercial banks and other financial intermediaries are major sources of financial instability is hardly disputed. It is equally well-known that, due to their economic and political influence, powerful financial interests easily subvert government regulations, thereby periodically reproducing financial instability and economic turbulence. By contrast, public-sector banks can better reassure depositors of the security of their savings, as well as help direct those savings toward socially-beneficial credit allocation and productive investment. In this sense a fully developed credit system is the antithesis of capitalism, and represents organization and control as opposed to anarchy. It has its source in socialism, but has been adapted to capitalist society; it is a fraudulent kind of socialism, modified to suit the needs of capitalism. It socializes other people’s money for use by the few . There are compelling reasons not only for higher degrees of reliability but also higher levels of efficacy of public-sector banking and credit system when compared with private banking—both on conceptual and empirical grounds. Nineteenth century neighborhood savings banks, Credit Unions, and Savings and Loan associations in the United States, Jusen companies in Japan, Trustee Savings banks in the UK, and the Commonwealth Bank of Australia all served the housing and other credit needs of their communities well. Perhaps a most interesting and instructive example is the case of the Bank of North Dakota, which continues to be owned by the state for nearly a century—widely credited for the state’s budget surplus and its robust economy in the midst of the harrowing economic woes in many other states. The idea of bringing the banking industry, national savings and credit allocation under public control or supervision is not necessarily socialistic or ideological. In the same manner that many infrastructural facilities such as public roads, school systems and health facilities are provided and operated as essential public services, so can the supply of credit and financial services be provided on a basic public utility model for both day-to-day business transactions and long-term industrial projects. Provision of financial services and/or credit facilities after the model of public utilities would allow for lower financial costs to both producers and consumers. Today, between 35 percent and 40 percent of all consumer spending is appropriated by the financial sector: bankers, insurance companies, non-bank lenders/financiers, bondholders, and the like . By freeing consumers and producers from what can properly be called the financial overhead, or rent, similar to land rent under feudalism, the public option credit and/or banking system can revive many stagnant economies that are depressed under the crushing burden of never-ending debt-servicing obligations. “Who owns the Federal Reserve?” < http://www.federalreserve.gov/faqs/about_14986.htm>. This statement of President Wilson is quoted in numerous places. A number of commentators have argued that some of the damning words used in this much-quoted statement are either not Wilson’s own, or taken out of context. Nobody denies, however, that regardless of the exact words used, he had serious reservations about the formation of the Federal Reserve Bank, and the misguided policy of delegating the nation’s money supply and/or monetary policy to a cabal of private bankers.
. Ellen Brown, “How the Fed Could Fix the Economy—and Why It Hasn’t,” <http://www.webofdebt.com/articles/fedfixeconomy.php>. Hilferding’s book, Finance Capital: A Study of the Latest Phase of Capitalist Development, has gone through a number of prints/reprints. This quotation is from Chapter 10 of an online version of the book, which is available at: <http://www.marxists.org/archive/hilferding/1910/finkap/ch10.htm>.
. Margrit Kennedy, Occupy Money: Creating an Economy Where Everybody Wins, Gabriola Island, BC (Canada): New Society Publishers, 2012. Ismael Hossein-zadeh is Professor Emeritus of Economics (Drake University). 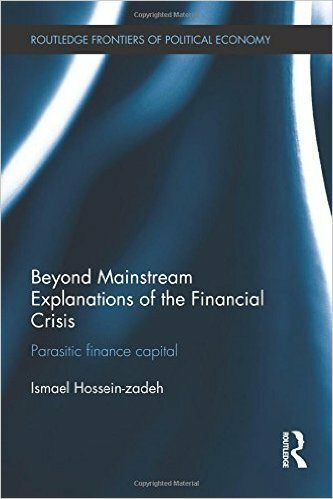 He is the author of Beyond Mainstream Explanations of the Financial Crisis (Routledge 2014), The Political Economy of U.S. Militarism (Palgrave–Macmillan 2007), and the Soviet Non-capitalist Development: The Case of Nasser’s Egypt (Praeger Publishers 1989). He is also a contributor to Hopeless: Barack Obama and the Politics of Illusion.